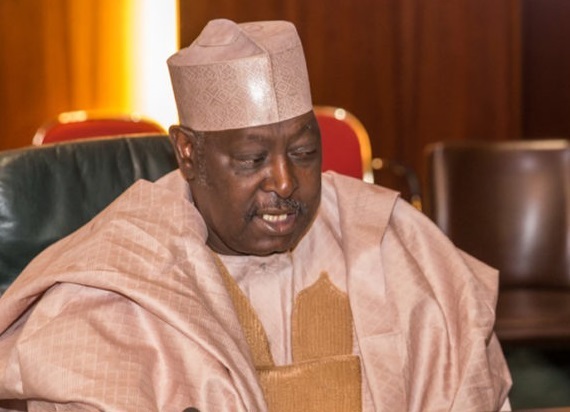 Babachir Lawal, immediate past Secretary to the Government of the Federation (SGF), has said one of the reasons for the defeat of the ruling All Progressives Congress (APC) in the March 9 governorship election to the Peoples Democratic Party (PDP) in Adamawa State is the questionable loyalty of Governor Jibrilla Bindow, the outgoing Governor of the state, to Atiku Abubakar. He made this claim in an interview published The Sun on Saturday. Babachir said although Bindow was contesting on the platform of the APC, he did not hide his love and loyalty to Atiku, the presidential candidate of the PDP, in the buildup to the general election. He said apart from publicly declaring his loyalty to Atiku, seven of the commisioners in Bindow’s outgoing administration were loyalists of the PDP presidential candidate. He said the Governor’s daughter was very close to Atiku. “It is on record that in so many fora, his supporters, his henchmen had said it in his presence and he didn’t take any step to deny it. I remember at one of their road launch somewhere in Adamawa State, the then Chief of Staff made a long speech in which he insisted that Adamawa State Government was for Atiku. Now, we did also point out the fact that the Governor himself had claimed that it was Atiku’s money that facilitated his victory at the polls. He had said that on several occasions. Bindow, the incumbent Governor of the state, contested on the platform of the APC but was defeated by Ahmadu Fintiri of the PDP. The election was intially declared inconclusive by the Independent National Electoral Commission(INEC) but after the supplementary election, Fintiri had 376,552 votes to defeat Bindow who had 336,386.